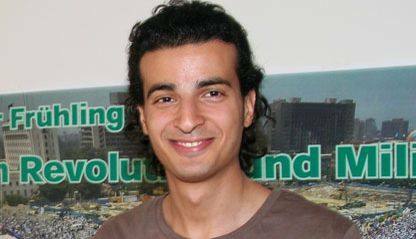 Just before the tour “Egyptian Spring – Between Revolution and Military Power” in Germany in May 2012 we interviewed Maikel Nabil Sanad, one of the speakers. In 2011 we had to witness several waves of repression against demonstrators and bloggers. How is the situation at present? About demonstrations, Now it occurs only in small number demonstrations. The military avoid attacking big ones, but still can do it in future. About bloggers, they still use the oppressive laws of the military regime. They target a lot infamous bloggers. They mainly use the law of "Insulting Religions" to persecute them. You and others have been released after many months in prison. Are there still political prisoners? How many? Why were they not released in the course of the mass amnesty? There are some activists were arrested after that, also some were not included in this amnesty. We don’t know their numbers because there is no transparency. We know only that the official numbers say that there are still 2,000 civilians imprisoned by military courts haven’t been released yet, I think the military is keeping them as a card to use when they want to calm down the opposition. Do you see yourself in acute danger of being rearrested? Yes, or maybe injured or killed. You proved very convincingly that the army and the people have never been one hand. Has this become common knowledge? To what extent is the military still popular among the general population and among pro-democracy activists? Nearly everyone believes the same now. It’s very rare now to find someone who believe that the army is protecting the revolution. I think the military now is in its worst situation since the coup of 1952. To what extent will Egypt continue to be controlled by the military? The military control 40% of Economy, 30% of the National budget. They have 4 Intelligence Agencies controlling nearly everything. They still control the media. They also put their men in senior positions in every civilian place. They are still protected by law. They can bring any citizen at anytime in front of their military courts. What do you expect from the various political forces, especially from the Muslim Brotherhood and from the Salafists? It’s a political chaos right now, nobody can predict anything. What are the implications of the new political constellation for the Copts? 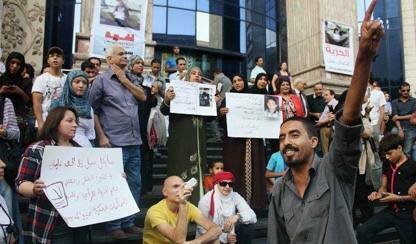 Minorities in Egypt are scared from the possibility of having an Islamic president. But I believe that they will coexist in all cases. How do you judge the situation in the various Arab countries? Peoples are asking for their basic human rights. They don’t mind to die for their dignity. Their rulers (with international support or silence) oppress them, and the fight is going. But people usually win in the end. Tunisia seems to follow a roughly similar route as Egypt. Are there decisive differences? I think that Tunisia is doing better. They didn’t have electoral fraud as Egypt. Islamists didn’t get the majority as Egypt. Islamists there dropped the idea of putting Sharia in the Constitution. The military is out of power. So, I think it’s better in Tunisia. Libya has gone through a civil war, with one side supported by external military intervention. From Syria we get news about horrendous massacres and a civil starting there as well. How do you judge the situations in Syria, Libya and Yemen? What course of political action do you recommend? In cases of Syria, Bahrain & Yemen, the international society proved it’s failure. Everyday the international institutions fails to ensure human rights levels, these revolutions become more religious, more militarized, more anti-western, and more anti-peace. The world chose to abandon them, so we don’t have the right to blame them if they became enemies. I recommend: 1. stopping double standers. 2. interfering by any mean to stop human rights violations, and force nations to respect it’s human rights obligations. There is a danger of war in the Middle East, involving Iran, Israel, Western powers and others in the region. How do you judge the situation? What can be done to deescalate and to prevent war? How will Egypt be affected by a war between Iran on the one hand and Israel or Western powers on the other? I don’t believe any war will happen between Iran and Israel. Both countries start this war propaganda before each election to gain more votes based on security and national issues. They are making the same thing for three decades, and the world is still deceived by it every time. How will the relationship to Israel develop? Will the cold peace last? Is there any possibility to overcome the widespread hostility within the Egyptian society towards Israel? The hostility will end when Israel end its military occupation to west bank, and dissolve its settlements their. I don’t expect any progress in peace relations in Middle East as long as all sides (Israeli, Egyptian, Palestinian) are not doing anything to enhance the relations. The Egyptian military used to rely heavily on U.S. and Western financial support. Will this alliance continue? Yes, Egyptian dictators needs someone to fund and protect them. And Israel needs someone to pay for peace, and USA need Egypt and Israel for its military interests. The Erdogan government is marketing Turkey as a political and social model for Arab countries. To what extent is there a readiness in Egypt to adopt political patterns and ideas from Turkey and to align itself with Turkey and others? Democratic forces in Arabic-speaking countries are studying every democratic model in the world. The Turkish is one of them (even it’s not that democratic). I think that from a national prospective, they won’t follow a single model. They will take from different models and mix between them. How is the "No to Compulsory Military Service" doing? We are small, but growing - functioning everyday more than before. You are to our knowledge the first person in Egpyt and in the Arab world to declare in public your conscientious objection to military service, your group is the first to say no to conscription. How do other political forces react to your demands and ideas? Politic forces need sometime to understand our new ideas, and to link it with their pragmatic interests. Also, we need the military out of power, to help politicians declaring their support without fear. You have quite specific positions that render you are minority even within the pro-democracy movement, such as your rejection of compulsory military service and of nationalism and of hatred towards Israel, and, your atheism. Some people reject me heavily, then after years start defending my ideas. I’m breaking taboos, and they need time to understand. But everyday, there are more people convinced that I’m right. How does this affect your practical work? Do you concentrate on the promotion of your specific demands or do you work more within broader alliances? I’m usually active in the fields of democracy, human rights & freedom. But special activities about peace and the military attract media more. Do you know of other groups or persons in other Arab countries opposing militarism, conscription, nationalism and hatred towards Israel? There are many of them. They are just unpopular. They have troubles in funding, making new memberships, and lots of legal troubles with governments. If we became free societies, these groups will have stronger effect.